Expect the first flakes by 5 AM in western New England and 8 AM at the coast. On average, climatological stats give Worcester its first inch of snow around November 26th. 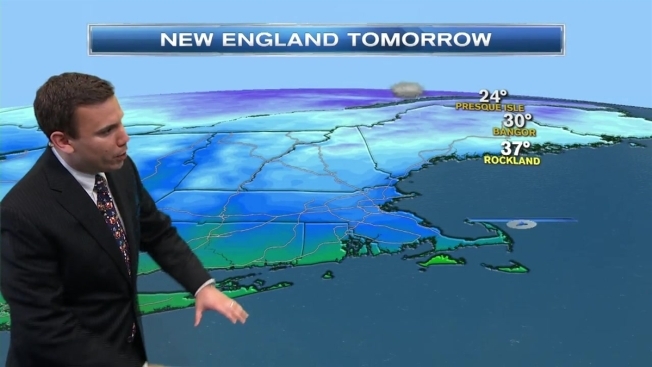 With a clipper system moving through tomorrow, Worcester could see their first inch. So far, the storm systems this season haven’t had a whole lot of cold air to work with. The higher elevations of Massachusetts, Vermont, New Hampshire and Maine have all received significant amounts of snow this season, but not the valleys. The next one to two weeks look colder and a lot more active. With this pattern in place, most of New England will have some snow on the ground by mid-December. Tomorrow’s snow will be light, but it has the potential to produce significant impacts on the Monday morning commute. Temperature overnight will drop below freezing, which will allow the ground temperatures to cool off as well. By daybreak we will see a batch of snow move in. Expect the first flakes by 5 AM in western New England and 8 AM at the coast.